This marks my third ever Taste of the Nation event, and second Philly one. Taste of the Nation: Philly 2010 was held this past Monday at the Loews Hotel on Market Street, the same location as last year. I impulse bought a VIP ticket over a standard ticket since I remembered how much fun I had last year. Last year, I went on my own, and still had a great time. This time around, I coaxed one of my friends to tag along. These events can be a bit pricey, but they’re a ton of fun and 100% of the ticket sales go towards child hunger. If you’ve never gone, you’ve gotta try to make it out next year, it’s worth it. mixologists from the franklin mortgage & investment co. It was my very first time trying beef tartare (finally!) and I must say, it was pretty good! The red velvet cheesecake was fantastic! Fond’s chicken liver mousse was probably my favorite dish of the night. I had maybe three…umm..four…maybe more…I’m not saying. It was oh so good. salmon ceviche (suh-veech)…sorry jen, i had to haha. -why have i not gone to amis or bibou yet? -must go to 10 arts again (hopefully soon). -can i have that chicken liver mousse from fond for lunch…like weekly? -taste of the nation events are so much fun. Did anyone else go? What did you think of the event this year? Last week, I finally made my second trip to Village Whiskey. During my first visit to Village Whiskey, I unfortunately didn’t get to try the duck fat fries and the Whiskey King burger. I was having a pretty awful day…so in an attempt to feel better, I indulged in the duck fat fries and the Whiskey King burger (pictured above). 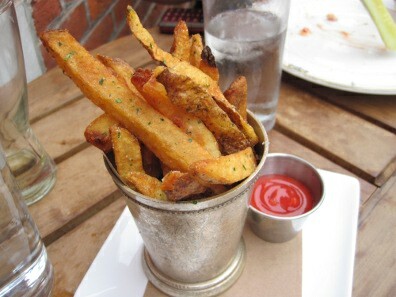 The fries were tasty with a good crispness to them. I didn’t dare bother dipping them in the ketchup as I find ketchup and fries together to be a sin, unless they’re really subpar fries that only ketchup can save. The burger I got the last time was fantastic, but this one just completely blew that one out of the water. Can there possibly be more flavor than the burger I ordered last time? Yes, yes there can. 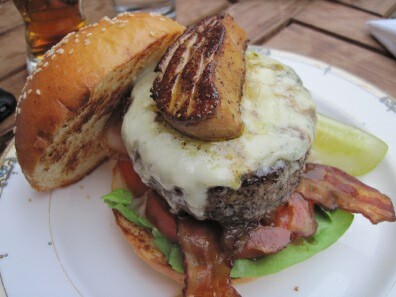 Everything was delish…the beef, foie gras, the sharpness of the bleu cheese, sweetness of the cipollinis…ahhh foodgasm. You honestly have to try this. It’s a little steep at the price of $26, but if you’ve never tried it, it’s worth the investment! Osteria has a really comfortable atmosphere..perfect for a date or a relaxing meal with friends/family. The seats were pretty big and you definitely had a lot of personal space (good and bad, I guess). Waitress was excellent and I couldn’t complain. The meal started off with a “basket” of bread and breadsticks with olive oil to dip. The meal was fantastic and we were definitely stuffed afterwards. That parma pizza was great. I was gunna order either the parma or the polpo and the parma won since I’m a sucker for arugula and prosciutto. I got to try a little bit of everything at the table and my second favorite was definitely the chicken liver rigatoni. The appetizers and desserts were also fantastic. You bet I’ll be coming back here…once I can save up some money again haha. Last Saturday in South Philly was the Flavors of the Avenue food festival and Crafty Balboa craft/art show. East Passyunk Avenue was closed between Tasker and Morris Street for the events. It was an absolutely gorgeous day and I had a great time! Flavors of the Avenue was held in a tent at the south end (which was a bummer since it was so beautiful out). There were tables set up all around the perimeter and several South Philly restaurants participated as well as a few wine and beer tables. Unfortunately, I didn’t get to eat as much as I had intended. I just wasn’t that hungry. Some of the food I did have was pretty tasty though. Ray’s Happy Birthday Bar had Philadelphia Brewing Company’s Newbold IPA and Fleur de Lehigh, their spring/summer seasonal on tap. 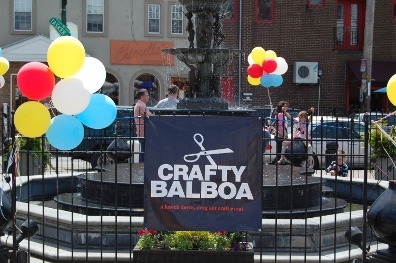 Crafty Balboa was held on the north end of EPA right by Tasker Street. Many tables were set up with everyone selling all sorts of different arts and crafts. There were a lot of neat and interesting stuff for sale…from baby oneies to plush toys to t-shirts to prints. Aaron Takes Pictures, by Aaron Weber. See more of his stuff here. Exit 343 Design, by Steph Harvey. See more of her stuff here. After having Sonny’s, I remembered there was this neat ice cream shop nearby. It’s called the Franklin Fountain, an ice cream shop with a traditional, classic theme. In addition to ice cream, they serve some classic ice cream concoctions like egg creams, phosphates, and ice cream sodas. Father ended up getting a rum raisin scoop…and I got a hydrox cookie milkshake. I wanted to get something smaller, but I’m a sucker for milkshakes. I’ve gotta come back, their sundae menu seems pretty wild and it’s something I’ve gotta try at some point. On a random/awesome note…the Food Network was on scene as I was leaving! They were taping for an episode of The Best Thing I Ever Ate and Marc Summers and Duff Goldman chose this place. I wasn’t sure if they were present though..